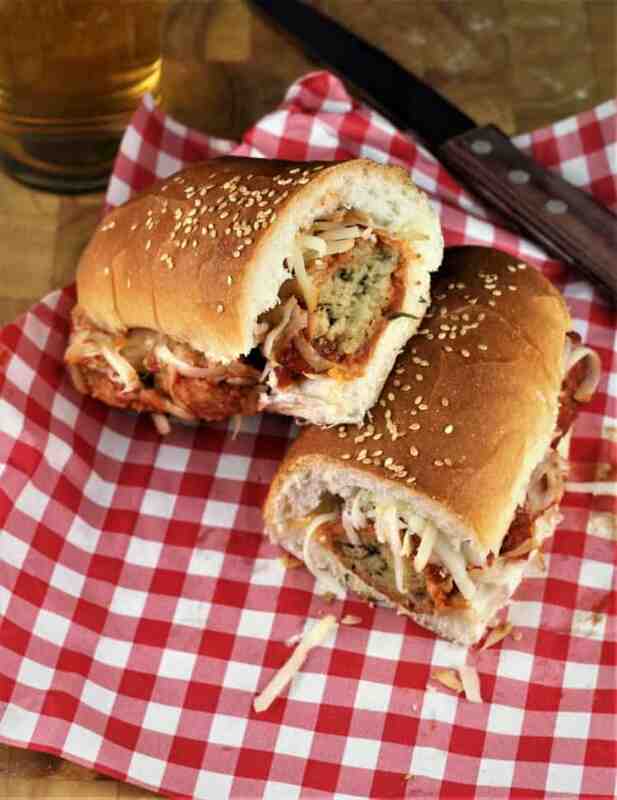 Eggplant Meatball Subs with Smoked Caciocavallo were inspired by Pasta alla Norma, a classic Sicilian pasta dish. Top with smoked caciocavallo cheese for a unique flavor! When I set out on this journey to explore my passion for food, I discovered that I enjoy teaching. A few weeks ago I had the pleasure of teaching a fresh pasta making class. One of the sauces we made was a tomato eggplant sauce, quite similar to the one for Pasta alla Norma. However, instead of the usual ricotta salata, we stirred smoked mozzarella into the sauce. One participant enthusiastically expressed that he would love to spread the sauce on bread and devour it! Little does he know how his words inspired me. 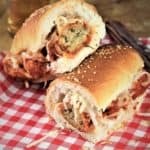 Driving home that night, I created this recipe for Eggplant Meatball Subs with Smoked Caciocavallo in my mind. I couldn’t wait to try it out as I imagined exactly what it would taste like! Can you? I’ve always loved meatless meatballs. My Spiralized Zucchini Ricotta Meatballs are a favorite at our house. These were inspired by my mother’s recipe. Back in Sicily my mother’s family almost always made meatless meatballs out of necessity. This is not surprising since meat was not only expensive but hard to come by. But to be honest with you I’ve always preferred my mother’s meatless meatballs. They are soft, incredibly moist and cheesy. She uses grated breadcrumbs from day old bread rather than dried breadcrumbs and plenty of cheese! I will definitely have to share her recipe with you soon! Before baking them I dredge them in dry breadcrumbs. This gives them a nice crunchy exterior. At this point you can serve them as is. These would make an excellent appetizer, or you can move on to the next step. After they have baked for 25 minutes, I simmer them in a basic tomato sauce for 20 minutes longer. Now they would be ready to serve with your favorite pasta. Begin by preparing the eggplant. Remove the skin of the eggplant with a vegetable peeler. Cut into 1 inch cubes. To remove the bitter juices from the eggplant, place cubes in a large bowl, salt generously and cover with water. Let sit for about half an hour. Drain the water, rinse and pat the cubed eggplant dry. Preheat oven to 400F and place eggplant on a parchment paper covered baking sheet. Coat generously with olive oil and salt lightly. Bake for 30 minutes, tossing halfway. If eggplant is dry, add additional oil. Set aside to cool. 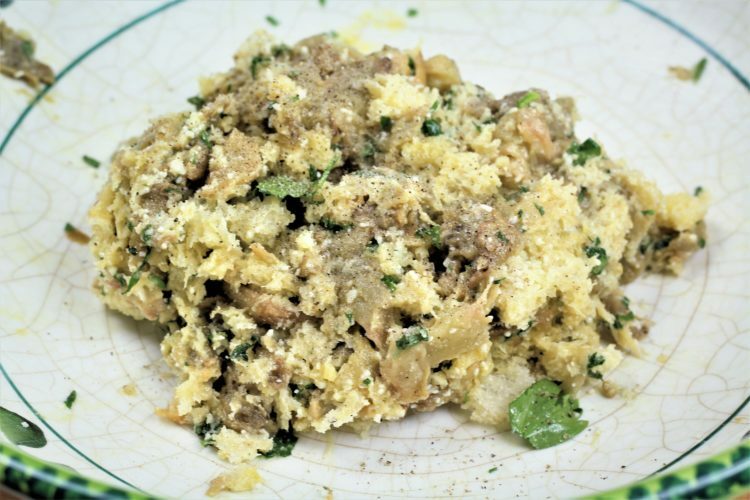 In a large bowl add freshly grated breadcrumbs from day old bread, crusts removed. I use my food processor and pulse the bread a few times until I have coarse crumbs. Add grated Pecorino Romano/Parmigiano cheeses; fresh parsley; a clove of garlic; baked eggplant; an egg and salt and pepper. 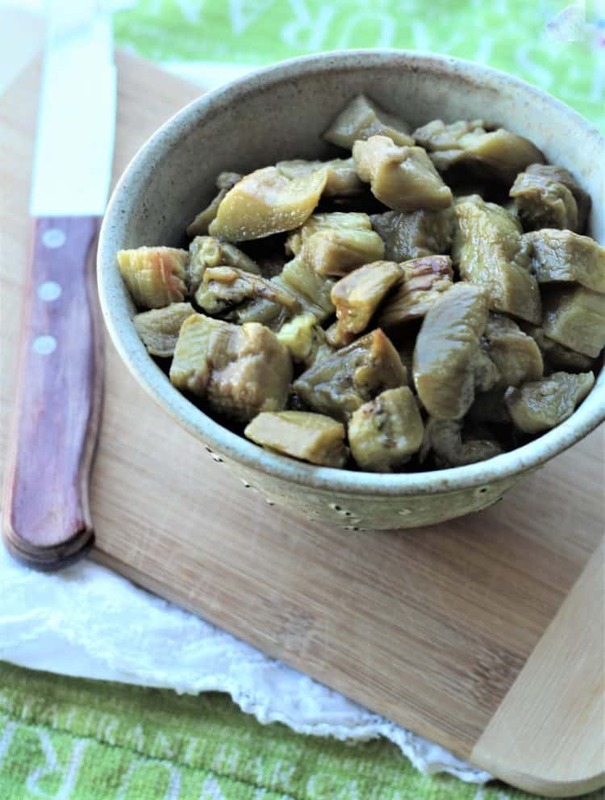 I use my hands to combine the ingredients and break down the chunks of eggplant. I prefer leaving the eggplant in chunks rather pureeing it. 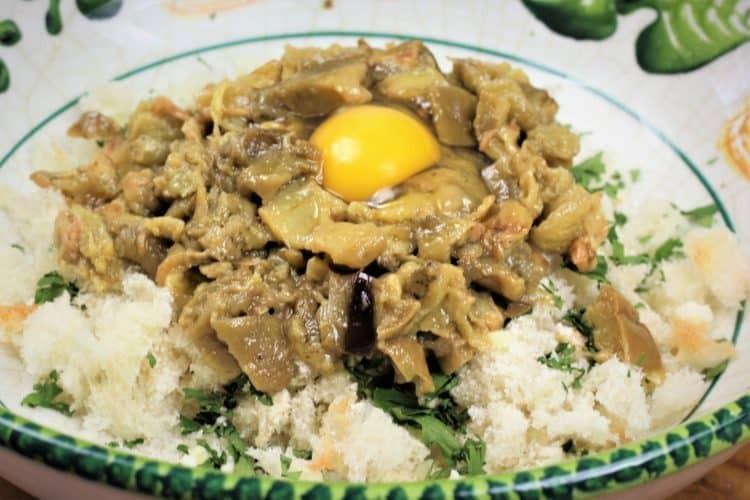 This is a question of taste and you can crush the eggplant pieces with a fork or purée them in your food processor if you prefer a smoother consistency. 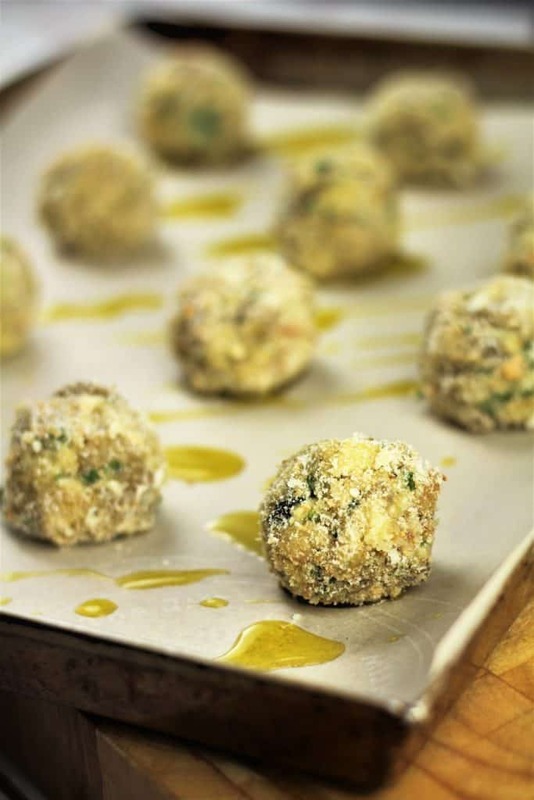 Shape into 12 meatballs and roll in dried breadcrumbs before placing on a greased sheet of parchment paper placed on a baking sheet. Bake at 350F for 12 minutes; turn them over and continue baking for another 12 minutes. While the meatballs are baking, prepare a basic tomato sauce. Sauté a small diced onion and a minced garlic clove. Add 2 cups tomato purée (or tomato passata), salt and pepper to taste and let simmer while the meatballs bake. When done, add the meatballs to the sauce and let simmer 20 minutes longer. To assemble the sandwich, slice open 2 sub breads and warm in the oven, if desired. Fill with as many meatballs that will fit in your bread and top with 1/2 cup of smoked caciocavallo. I squeezed in 5 or 6 meatballs. The heat of the bread and meatballs will melt the cheese. Cut in half and serve warm! 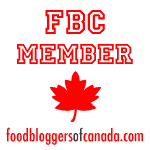 I purchased smoked caciocavallo cheese in my local Italian grocery store. If you can not find smoked caciocavallo, smoked mozzarella (or unsmoked mozzarella if you prefer) may be substituted. Eggplant meatballs can be frozen. Freeze after they are baked and prior to adding to the sauce. They can later be defrosted and then simmered in tomato sauce. Alternately, freeze the meatballs along with the tomato sauce. Defrost and heat them up in order to prepare the subs or enjoy with pasta. 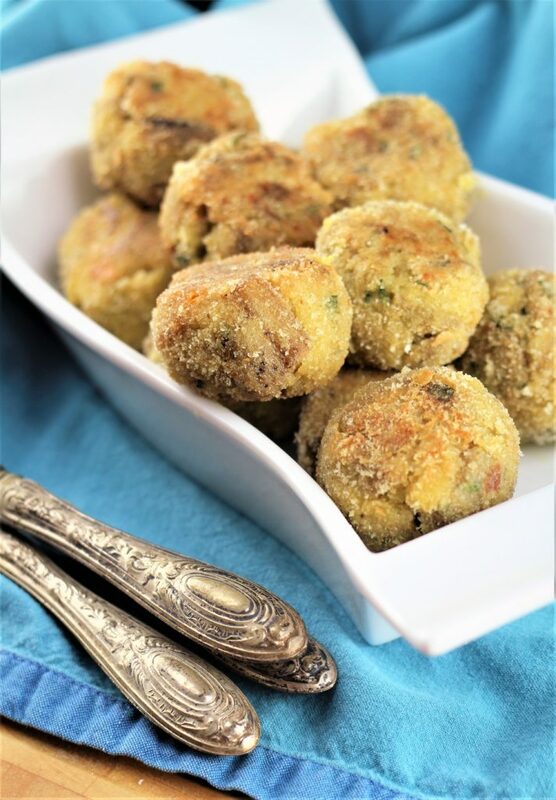 Whichever way you choose to serve your eggplant meatballs, you will love this vegetarian alternative to traditional meatballs. Please share your photos with me by tagging me with @mangiabedda or #mangiabedda on Instagram or Facebook. Buon appetito! 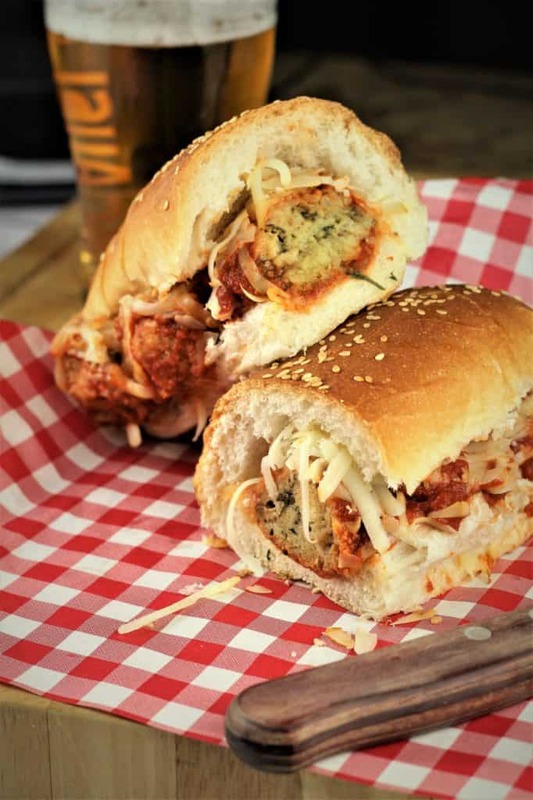 Eggplant Meatballs Subs with Caciocavallo are the delicious vegetarian alternative to traditional meatball subs that everyone will love. 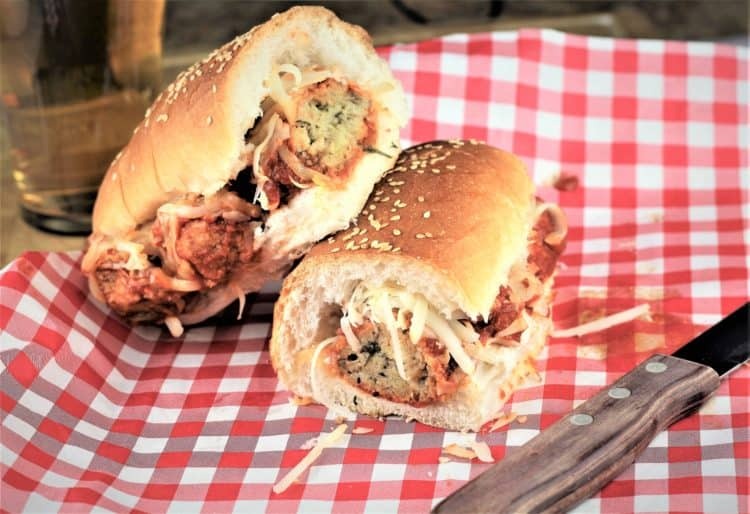 Smoked caciocavallo cheese bring these sandwiches to a whole new level! Peel the skin using a vegetable peeler. Cut the eggplant into 1 inch cubes. Place in a large bowl, salt generously and cover with water. Let sit for 30 minutes. Drain the water from the eggplant and rinse until the water is clear. Pat the eggplant cubes dry with a paper towel and place on a parchment paper covered baking sheet. Salt lightly and toss with olive oil. Bake for 30 minutes, tossing the eggplant pieces halfway. If the eggplant has absorbed all of the oil and appears to be dry, drizzle with extra olive oil. Set aside to cool slightly. Lower the oven temperature to 350F and place a clean sheet of parchment paper on the baking sheet. Drizzle with olive oil. In a large bowl combine the meatballs ingredients listed (from breadcrumbs to salt and pepper). Add the baked eggplant. Use your hands to combine the ingredients, breaking down the pieces of eggplant in the process. Shape into 12 meatballs. Dredge each meatball in the dried breadcrumbs and place on the baking sheet. Bake for 12 minutes, turn over and continue baking for 12 minutes more. While the meatballs are baking, prepare the sauce. In a medium sized deep skillet or sauce pan, heat the olive oil. Add the onion and sauté for 3-4 minutes. Add the garlic and cook for 1 minute longer. Pour in the tomato purée, lower the temperature and let simmer while the eggplant is baking. Add salt and pepper to taste. When the eggplant meatballs are ready, transfer them to the sauce and let simmer for 20 minutes longer. Slice open the submarine bread and warm in the oven for a few minutes if desired. Place 5 or 6 meatballs in the bread (or as many as you can fit according to the size of your bread). Top with about 1/2 cup smoked caciocavallo. 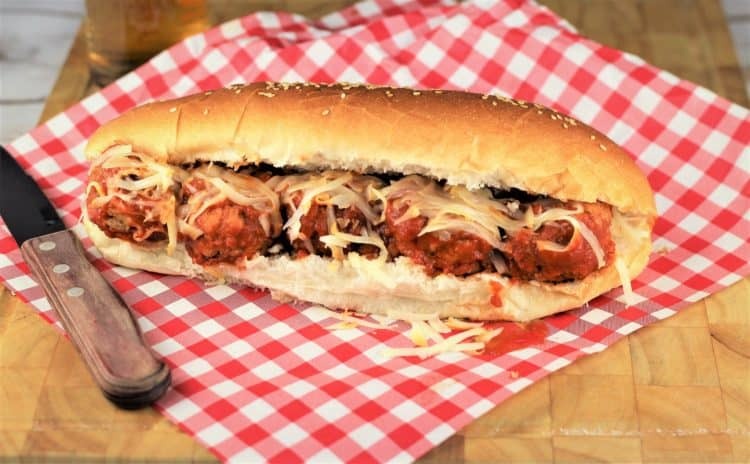 The heat of the meatballs and the bread will melt the cheese. Serve immediately! If you prefer a smoother consistency, the baked eggplant can be puréed. If you can not find smoked caciocavallo, smoked mozzarella (or unsmoked mozzarella if you prefer) may be substituted. Eggplant meatballs can be frozen. Freeze after they are baked before adding to the sauce. They can be defrosted and then simmered in the tomato sauce. 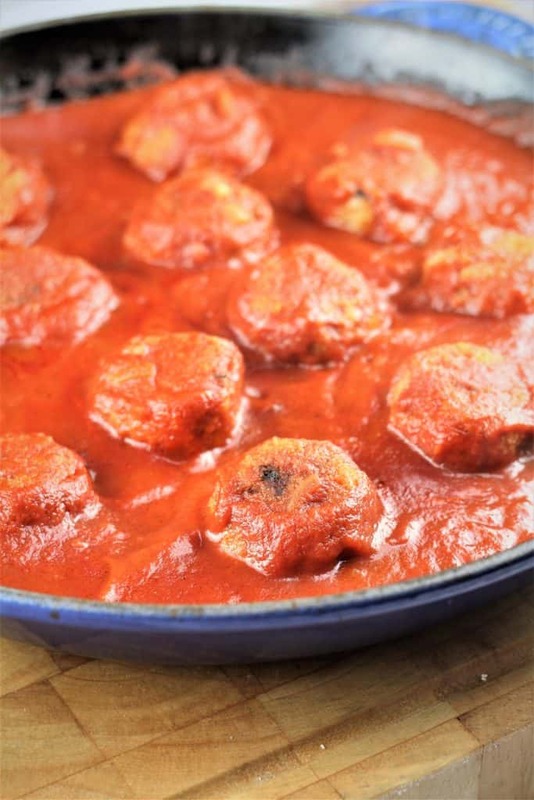 Alternately, freeze the meatballs already simmered along with the tomato sauce. Defrost and heat them up in order to prepare the subs or enjoy with pasta. Please note that the nutritional value provided is approximate and may vary according to exact portion size and ingredients used. Wonderful Nadia. Inventive use of eggplant and I cannot wait to try this. Thanks Anna, I love making vegetarian ‘meatballs’. Hope you enjoy them! Thanks Mirella, so kind of you. I hope they enjoy them!